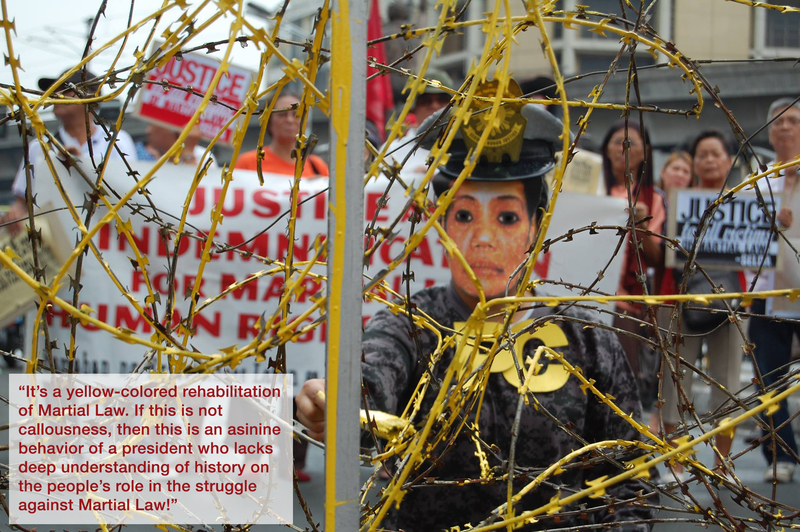 “It’s a yellow-colored rehabilitation of Martial Law,” SELDA chairperson Marie Hilao-Enriquez called Pres. Benigno Simeon Aquino’s defense of the appointment of former PNP General Lina Castillo-Sarmiento, as chairperson of the Human Rights Victims Claims Board. The group returned to Mendiola on Friday to demand the nullification of the President’s appointment of Sarmiento, a member of the defunct Philippine Constabulary during Martial Law and later on became a two-star general of the present PNP. Three protesters, dressed as Pres. Aquino, Sarmiento and CHR Chairperson Etta Rosales, painted yellow the rolls of concertina wire on steel frames blocking the road going to Malacañang. The act symbolizes the scheme of the Aquino government in trying to conjure a police-military effort of dispensing reparation by appointing a former general to head the martial law victims’ claims board. “If this is not callousnes, then this is an asinine behaviour of a president who lacks deep understanding of history on the people’s role in the struggle against martial law,” Enriquez added. “The Aquino administration is trying so hard to defend this shameless appointment by shrugging off criticisms from different groups, institutions and personalities who have fought martial law. Does this foretell how the Claims Board (HRVCB) will act on the victims’ clamor for the long-overdue justice? We all know that justice should be rendered soon especially that many of the victims worthy of recognition and reparation are in the sunset of their lives. But isn’t Pres. Aquino’s defense of Sarmiento’s appointment a way of killing us softly? Rubbing more salt into a gaping injury? exclaimed Enriquez. SELDA reiterated its position that Pres. BS Aquino’s appointment is a total disregard of the provisions stated in Republic Act 10368, or the Human Rights Victims Reparation and Recognition Act of 2013, which state that the members of the HRVCB should have deep and thorough understanding and knowledge of human rights and involvement in efforts against human rights violations during the regime of former President Marcos. “It is not only her credentials as former PC officer that is anathema to the Filipinos’ historic struggle against Martial Law, but her zero track record of any involvement in asserting human rights nor any understanding or knowledge of the plights and struggles of Martial Law victims during and after the dark days of the Marcos dictatorship,” said Enriquez. 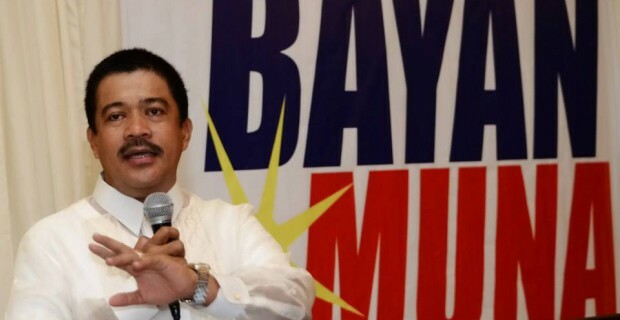 The group maintained that former PNP General Sarmiento should not head the Claims Board, being part of the PC which, along with the Armed Forces of the Philippines, became the main machineries of the Marcos dictatorship in implementing the worst of human rights abuses under Martial Law. It was the PC and the AFP that dispersed rallies, “salvaged,” abducted, tortured, arrested and detained thousands of Martial Law activists. Up to the present, these military apparatuses are still the violators of human rights. “Thus, General Sarmiento’s presence in the Claims Board does not inspire respect nor confidence in the hearts of the Martial Law victims, even if the President’s apologists have positively endorsed her appointment, ” Enriquez said.